No matter where your home is, if there’s a dark and damp area that gets neglected, you can find yourself with a mold and mildew infestation. The seeds and spores that get spread by fungi can do a surprising amount of damage to the surfaces they grow on, and in even worse scenarios, the spores can be inhaled and cause either minor health problems (slight coughs) or major health complications (chronic lung illness). The following are some of the top reviewed choices on the market for getting rid of your home’s fungal infection before it gets out of hand. 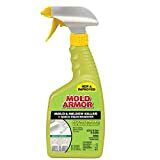 Home Armor Stain Remover is designed to be powerful enough so that it can remove the fungus thoroughly enough to spare the owner the need to scrub the area down manually. Its power is enhanced through the inclusion of bleach in its formula. 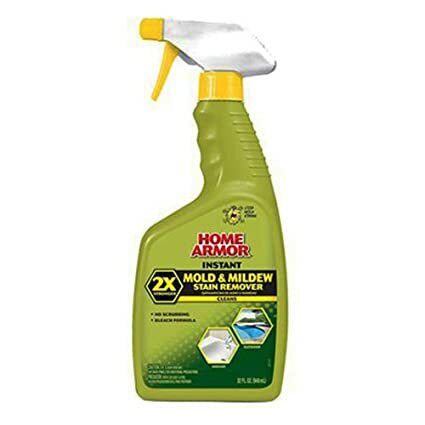 According to the manufacturer, the ingredients composing Home Armor make it twice as powerful as the leading brands on the fungus remover product market. It is meant to be used on tile, grout, tubs, toilets, fiberglass, shower doors, vinyl curtains, counters, and sinks. Owners have testified that it can be effectively used on finished wood and boat equipment without any problems. One owner reported that they successfully used it on both their painted cement slab and their unpainted cement steps. In order to test the safety of the remover, one owner decided to spray it on a small painted area away from the infestation in order to determine whether or not it would cause any fading; from what they could see, no fading resulted. The owner also used remover on their vinyl awning, their vinyl siding, vinyl storm doors, vinyl tire covers, and their home’s aluminum gutters and sofits. Overall, the owner testified that Home Armor was the top stain removal product that they had ever decided to use in their home. 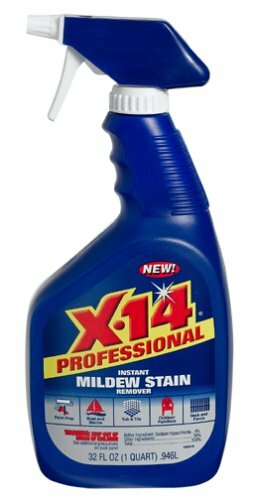 X-14 Professional Instant Stain Remover is meant for both home owners and professional tradesmen alike. The remover is a maximum-strength brand that’s billed as being 66% stronger than the average removers on the market. The composition of the remover is strong enough to be applied on most fungi-affected surfaces for instant results. Owners testify that the remover can correct most mildew infestations successfully, though results may vary depending on the affected area. One owner testified that they had used it for the caulking on the top edge of their bathtub and had been pleased to see nearly perfect results, though they did notice a potential drawback; the owner noticed an interaction between the remover and the metal of their bathtub drain. After using the remover on their bathtub, they found that the fluid that seeped down into the drain had actually somewhat corroded the metal surface; for that reason, the user suggested that any prospective owners be careful about using the remover on any other metal surfaces in the home. Users may also want to consult professionals at their local car dealership before deciding to use the remover on their car body paint. Aside from the cautionary advice that certain users give about the remover’s smell and its potential to corrode metal, the general reception to the X-14 has been resoundingly positive. One owner testified that they had run into a serious mildew problem with a shower that hadn’t been used for years. After many months of neglect, it has spread from the caulk, to the corners, and had even made its way deep into the shower drain. With just one application of the X-14 remover, they were pleased to see that the mildew was almost instantly done away with. After two more applications, there was hardly any mildew in the shower left and they still had over 33% of the bottle remaining. Star Brite Mildew Stain Remover is made in a way that trades off a slight degree of raw power in exchange of a higher degree of applicability to different materials. In addition to vinyl covers, fiberglass, plastic, painted surfaces and headlines, Star Brite is made for effective application to cushions as well. Compared to some of the harsher mildew removers, this is designed to be safely used on all surfaces with a reduced risk of causing damage to the underlying material. The material may not be quite as intensely strong as others, but as the same time, customers testify that it’s still reliable enough to remove infestation problems within minutes of coming into contact with the problematic fungus. The formula making up Star Brite is billed as being a “special buffered” composition, which is specially composed in a fashion that isn’t antagonistic to the owners’ upholstery or threads. With the special buffered formula, users can liberally apply to many different places in their home or automobiles where mildew infestation is causing issues. In order to apply the remover effectively, users need only spray once and then refrain from wiping down the area before the mildew stain has completely vanished from the affected area without a trace. Users have testified that they’ve been able to effectively apply Star Brite to their boat tops, vinyl chairs, vinyl canopies, tile, grout, shower stalls, curtains, awnings and more without any persisting issues. Even with the proven effectiveness, owners are advised that the more persistent stains might require a second spraying and a little bit of hands-on scrubbing before being completely removed. After the stain has been removed, the user should wash down the area thoroughly. Tilex’s low price belies the power it has to take care of mold and mildew swiftly. One customer testified that it has proved to be particularly useful for their bathroom wall tiles, bath tub and floors. The owner testified that after applying the remover, they ventilated the bathroom and left for about 20 minutes while the chemicals got to work; after returning, the user found that their tiles were just about completely cleansed. Once seeing that the tiles were clean, the user simply had to rise the walls with their shower head to finish the job off, without any need for hands-on scrubbing. The type of cleaners that you’ll choose between may be differently suited to different kinds of mold removal. Some removers are designed to be used for on mold/mildew that is still active on the affected surface (“on-line”), while others are meant to be used on mildew that has already been removed from the affected surface and cooled. Different types of removers will usually have a certain temperature range in the mildew that they’re best-suited to being used on. Generally speaking, the range in mildew temperatures will be divided into three different categories: cold molds (room temperature), warm molds (100-150 °F), and hot molds (200-300 °F). Getting an approximate figure on the on the temperature of the mold that you’re targeting will help you choose the most effective remover to take it out. Naturally, you’re going to want to be sure that the amount of remover you have is enough to tackle the entirety of the problem and not just a fraction of it. It might be a good idea to purchase more than you initially believe you need, just in case there happens to be more mildew or mold in your home than you initially anticipate. Depending on the effectiveness of the remover, you might wind up needing more or less than you expected. Different degrees of mildew/mold infestation are going to call for different levels of remover strength. Be sure to invest in removers that have the right degree of power to take out mildew thoroughly, as this will prevent you from needing to overcompensate by spraying an excessive amount. It is wise not to rush into buying a mold or mildew stain remover before fully understanding how it’s going to interact with the particular material that the fungus has affixed itself to in your home. Depending on the remover, it may be meant for application on shower doors, counters, curtains, or everything in-between. You’ll want to make sure that you don’t wind up doing avoidable damage to your home in the process of removing fungi by using a remover that corrodes the material, so be pragmatic about studying up on how it interacts with certain materials. Do not put off cleaning up your mold problem, you don't want to end up with mold symptoms. To choose the most effective remover, you’ve first got to make a point to take a solid profile of your infestation site. Taking every element of the infestation site into account will ensure that you can pick a remover that suits your needs without causing unnecessary damage to any of your important household material in the process. Mildew removers may be designed for the eradication of fungi that is of a certain temperature and affixed to a certain kind of surface, so be sure to take note of things no matter how easy it may be to overlook. A mildew removal job is the type of task that can either be done right one time or easily exacerbated, so take as much time as you need to find the best remover to employ.